5 ml and 2 ml dropper bottles; tablets - 10 tablets in blister packed in cartons. Sexual behaviour correction without surgery. Reduction of owners' troubles related to animal sexual behaviour. You may interrupt course of use at any time and recover sexual cycle. 1 ml of Four and a tail drops regulation of estrus contains megestrol acetate - 20 mg (as an active ingredient. 1 tablet of Four and a tail tablets contains megestrol acetate - 5 mg as an active ingredient. Mechanism of megestrol acetate action (component of the drug) involves effect on hypotalamo-pituitary system and block of gonadotrope (FSH and LH) secretion by anterior pituitary. Decrease in gonadotrope blood level causes folliculogenesis disorder in females (so, follicular maturation and their ovulation do not occur), inhibition of uterine cell hyperplasia and mammary gland secretion. Decrease in gonadotrope blood level suppresses hormone-dependent neoplasms. Drug administration leads to decrease in testosterone levels in male dogs and cats and estrogen levels in female ones causing estrus inhibition. In case of drug withdrawal, megestrol acetate concentration decreases, normal LH/FSH blood level recovers, contraceptive action stops and sexual cycle restores. Use Four and a tail drops for regulation of estrus in female dogs and cats to detain and interrupt estrus, as well as in male ones to decrease sexual activity and correct behaviour. The drug is contraindicated for female dogs and cats since 3 days after estrus beginning; immature, pregnant and lactating animals, as well as for animals of both sexes with genital diseases, breast tumors, diabetes, hormonal disorders and increased individual sensitivity to the drug components. 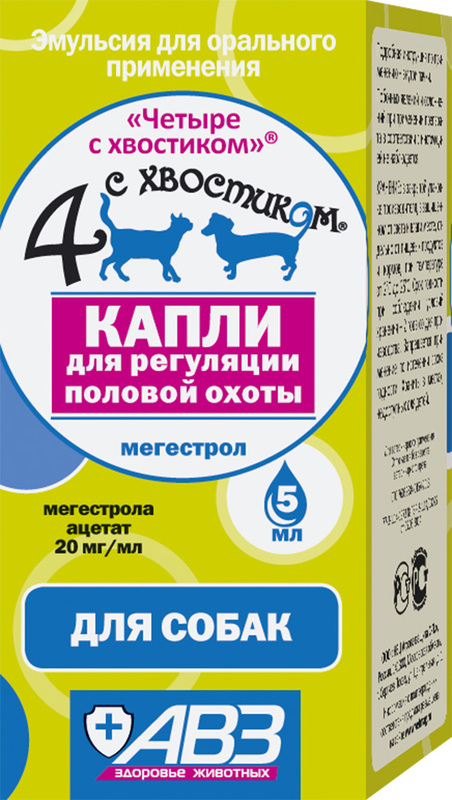 Four and a tail drops for regulation of estrus and tablets are intended for individual oral administration 1-2 hours before feeding (forced administration on the base of tongue or use with a treat according to the following schedule). A break (2 months at least) is recommended before beginning of new course of use. In case of normal physiological sexual cycle in treated female cat, you may repeat the course. If estrus beginning is difficult to be determined, you would rather detain it than interrupt. In order to detain estrus, start drug administration 7-15 days before its beginning. In the light of body weight, doses are listed in Table 2. Administration duration depends on desired date of estrus detainment (up to 32 days). Estrus may start in a few days after the drug withdrawal. In case of long-term drug administration (about a month), estrus usually starts in 4-6 or sometimes in 2-9 months. Four and a tail drops for regulation of estrus dosage to detain estrus in female dogs depending on body weight. In order to interrupt estrus, use the drug in appearance of the first signs (within 3 days after beginning). In the light of body weight, dosage is listed in Table 3. Administer daily dose during the first 3 days of course, then half it within the following 7 days. After the drug withdrawal estrus usually starts in 4-6 months or sometimes in 2-9 months. Four and a tail drops for regulation of estrus dosage to interrupt estrus in female dogs depending on body weight. Female dogs are recommended to be administered not more than twice a year. male dogs - 10 drops (0.5 ml) per 5 kg of body weight or 1 tablet per 2.5 kg every day within the first 7 days, then a half of daily dose within following 14 days. Adverse events and complications are generally not observed in case of Four and a tail drops for estrus regulation and tablets administration as per package insert. Body weight increase, mild depression or aggression may be rarely observed. Overdose may cause abnormal changes in tissue of uterus and ovaries, slight body weight increase, appetite growth, apathy, mild macromastia. Store in closed original package at 2-25°С. Shelf lives of drops and tablets are 2 and 3 years from manufacturing date, respectively.